Stanislaw Kowalski returns to a favorite venue — 4 1/2 hours from his home of Swidnica near the Czech border. WMA now lists outdoor world records for M105 (by Stan and Hidekichi), so anything Stan does at Torun will qualify as an indoor M105 world record. The registration list (which can be filtered to view entrants by nation, event, age group) says Stan has submitted NT (no time) in the 60 and NM in the discus. But he has a shot mark of 3.28 meters (10-9). The only other 100-plus entrant is India’s Man Kaur, the famed thrower and sprinter. At 102, she’s down for the 60, 200, shot and javelin (held outdoors, of course). I’m also intrigued by an “Independent” national entry. Sometimes, that means a banned Russian allowed to compete. But in this case, the entrant is M60 Mohammed Al-Dossary, who has competed for Saudi Arabia in the past. That Asian country has never been a WMA affiliate, I’m told. Mohammed is down for the 10K road run and half-marathon. The meet site says 4,000 are signed up, with Poland entering 845, Germany 475 and Britain 393. Team USA is No. 6 at 219 (not counting two from Puerto Rico). Meanwhile, a last look at Golden Bolt. 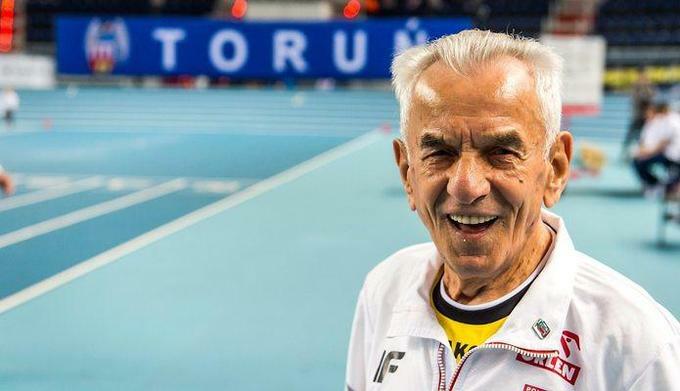 1 Comment on "History’s oldest trackster entered at Toruń worlds: Stanislaw Kowalski is almost 109"
WMA may need a 110-114 category soon.